Edited by: Sauda A. Barwani, Regina Feindt, Ludwig Gerhardt, Leonhard Harding, Ludger Wimmelbücker. Series edited by: Wilhelm J.G. Möhlig. In this book linguists and historians aimed for an assessment of the revolution of 1964 from the view-point of the defeated faction. The latter’s goal was the removal of the first democratically elected government of Zanzibar under the leadership of the Zanzibar National Party and the installation of a socialist regime under the Afro-Shirazi Party. 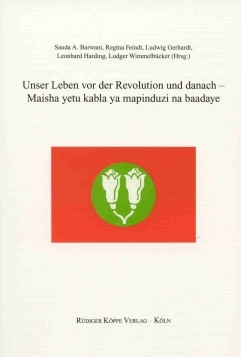 The interviews contained are a result of the interdisciplinary project section on “The Realisation of the Revolution of Zanzibar 1964 and its Perception”, part of the Collaborative Research Centre 520 Gesellschaftliche Umbrüche in afrikanischen Gesellschaften und ihre Bewältigung” at the University of Hamburg (1999–2003). The volume contains a broad outline of the historical context of events in the revolution as well as five selected important full-length interviews with eye witnesses taken in the course of the project. The interviews are reproduced in their Swahili original and provided with a German translation. The selection of interview partners was guided by criteria of content and pragmatics. Primary candidates were those eye witnesses that as reflecting and active participants may have shaped the course of events. It was further intended to provide for a cross-section of the social stratum that was forcibly displaced or fled from the island as a result of the failed revolution, avoiding that only men would render their perspective. Pragmatics ruled who of the prospective candidates could be contacted and was willing to be interviewed. In the end about 40 individuals provided their statements to members of the project. The linguists focused on the analysis of how the experiences and the coping with them showed in the choice of words, expression and narrative flow of the interviews. The historians analysed the subjective statements of the interviewees concerning their perception of the events in the context of current research on the revolution. Der mit Gewalt herbeigeführte Machtwechsel auf Sansibar im Januar 1964 wurde in den letzten vier Jahrzehnten aus den unterschiedlichsten Perspektiven auf seine Hintergründe und Folgen hin analysiert. Das von der Hamburger Forschergruppe vorgelegte Buch nähert sich dem Thema innovativ, indem fünf Interviews mit Zeitzeugen sowie ein sehr ausführlicher geschichtswissenschaftlicher Kommentar in der abschließenden Interpretation der Interviews zusammengeführt werden. Insofern ist das Buch nicht nur informativ, sondern auch in methodologischer Hinsicht für die Geschichtsforschung wichtig.